FUN… EXCITING… HOT and VERSATILE are the best words to describe this incredible group of musicians and local talent. 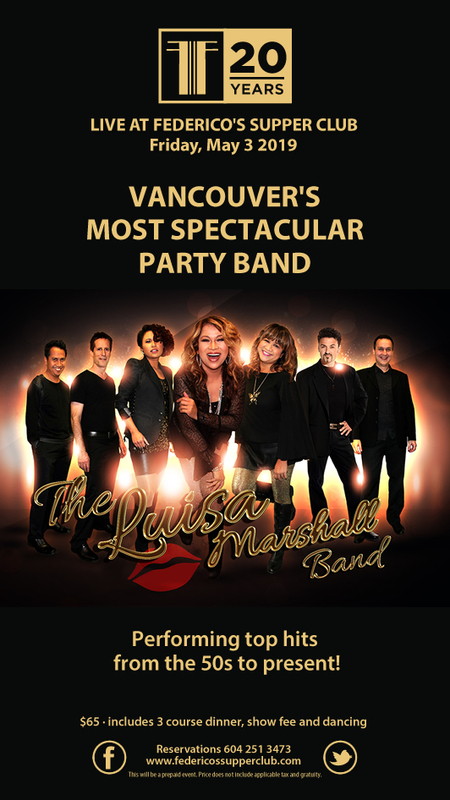 Lead, Luisa Marshall, is a world class tribute artist/performer with a 'rock n roll' attitude and powerful voice - well known for her tribute performances to dream diva Tina Turner, as well as Donna Summer, Lady Gaga, Beyonce, Rihanna, Etta James, Whitney Houston and Amy Winehouse. Television spotlight seems to favour Luisa as well, having been on Oprah twice, the Ellen Degeneres show, and invited to walk the Red Carpet at the Golden Globes in 2014. Dust off your dancing shows and get ready for an evening of high energy and fun with throwback favourites spanning five decades and including current dance hits at none other than Federico's Supper Club - where unique experiences are king! Federico's is the best Italian restaurant Vancouver has to offer.